I don’t know about you, but I needed a funny today and was tickled to see this Masters of the Universe Meme on Civilian Reader’s Blog. Some days we’ve all got a little Skeletor in us. 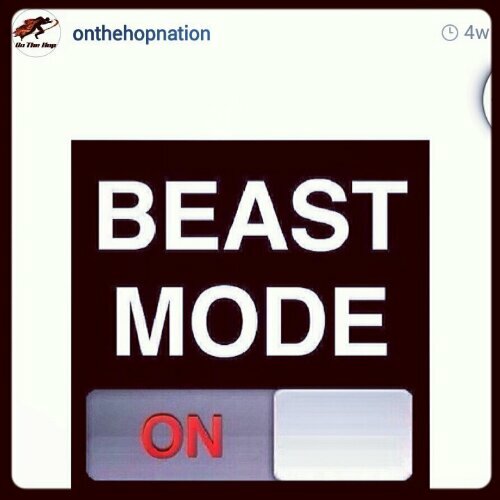 Off the Hop’s Instagram pic is an awesome Monday message. Redbox is renting video games — knarly dewd!! 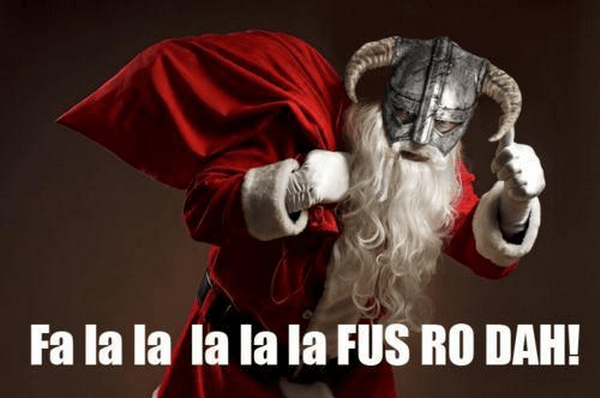 Fa la la la-laaa la Fus-ro-daaaah! APPY Geek<<read @lukekarmali‘s story here!! The study, known as the UK Millennium Cohort Study, by Alison Parkes, Helen Sweeting, Daniel Wight, and Marion Henderson (British Medical Journal) found that there was no causal link between playing video games and watching TV, and mental health issues. The authors found that watching TV more than three hours per week at five years of age resulted in behavioral problems for kids between five and seven years. However, there were no effects on hyperactivity/inattention, emotional symptoms, or social problems in these kids. Further, there were no problematic results in the kids who played the same amount of video games. As you may or may not already know, I address some of these issues in my reviews and discussions of video games. My findings are anecdotal, but relevant, I think.When I read findings from studies like the Millennium Cohort Study, I’m seldom surprised at the findings. My personal belief — based on personal experience with GamerDewd — is that there are some games (and TV shows for that matter) that stir up and impair frontal lobe function. Check out this super-cool interactive brain map, which shows that the frontal lobe is where all the planning, organizing, impulse control, problem solving, and control over emotions happens. As console wars kick into high gear in time for the holidays, the passion behind both sides was played out on the popular Comedy Central TV show, South Park, reports Wesley Yin-Poole (Eurogamer). GamerDewd has been after me for over a year about watching South Park, but it’s still an M (17+) rating as far as I’m concerned. He’s also itching to play the soon-to-be released game, South Park: Stick of Truth, which is slated for a March 4, 2014 release. Published by Ubisoft and developed by Obsidian Entertainment, this RPG is targeting a Mature to adult audience. The goal of the game is to assist Stan, Kyle, Kenny and Cartman as they attempt to save South Park and to become cool. The action starts with the player as the new kid in town who is faced with the task of making friends. The kids of South Park are in the midst of a live-action-role-playing-game which turns into a universal fight between good and evil, reports IGN. Like most South Park plots, the simple story arc seems fitting with the protagonists’ age (Grade 4), but the target rating of M or AO suggests there will be plenty of the boundary-pushing scenarios the South Park TV show has become (in)famous for. Still, like all games that are on GamerDewd’s radar, when it comes out, I’ll have a look and make a judgement call at that time. Gamer Dude: Can I play Shank? Gamer Dude: Awww, why not? Me: Because it’s a game called “shank,” I don’t think I need to elaborate. As you can see from the clip above, it’s a beautifully animated game done in a dramatic comic book style. The story of Shank can be told from two different perspectives: single-player campaign and cooperative campaign. The protagonist, Shank, is a mobster hitman whose MO is avenging the death of his girlfriend, Eva. Players control Shank and can choose from three different kinds of weapons: melee weapons (including a chainsaw — sigh), firearms (of course), and a pair of knives (to shank with, I imagine). The cooperative mode activates Shank’s able sidekick, Falcone. As in many multiplayer campaigns, this game requires players as the characters to collaborate and combine moves to complete “hits” and advance the story. EA Games, who released Shank in 2010 calls the game “a side-scrolling beat ’em up” game and I say this is an accurate description. Designed by Klei Entertainment, the game is available for play on Linux, Mac OS X, Microsoft Windows, PlayStation 3, and Xbox 360. Some may call me hypocritical because, as you’ve seen in other reviews, I’ve allowed Gamer Dude to play similar storylines (eg. Assassin’s Creed). Maybe I am, but for me, it’s all about context for the violence. Also, Shank is no Assassin’s Creed. Case in point, the action of Shank seems to center exclusively on executing violent deaths as part of Shank’s revenge plot. Shank is a straightforward, one-dimensional game with graphic violence at the forefront. While I love the art and animation in Shank, I can see little benefit to having this game in my home, and no value in allowing my kid to play it. This one’s for the parents, but the kids can have fun with it too. Found on CollegeHumor this morning — Fun, fun, fun! Thanks Dorkly! Relive picking your 1st starter Pokemon.